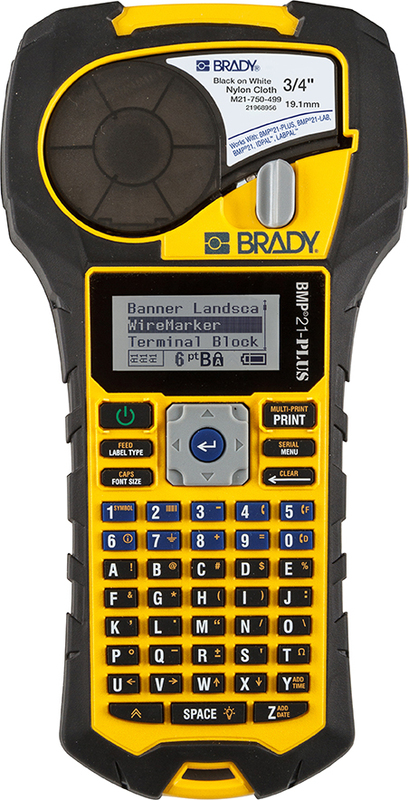 We first told you about Brady’s BMP®21-PLUS Portable Label Printer back in August. As we’ve watched its popularity grow over the past few months we wanted to refresh your memory about this rugged and versatile portable printing solution. When the original Brady BMP21 was obsoleted and discontinued this past summer, Brady took everything that made it popular and widely used and added to it. From this addition of new features, the BMP21-PLUS was born with its lower price, increased durability, smart automatic formatting with drop-in label cartridges, additional applications, and backward-compatibility with BMP21 label materials. If you’ll be using the BMP21-PLUS for applications like Electrical & Automation, Datacomm & IT, or Visual Workplace/Maintenance/Industrial, you’ll be happy to hear that in addition to the existing 46 M21 BMP21 cartridges, the –PLUS offers 24 new M21 cartridges. These new parts include Self-Laminating Vinyl, PermaSleeve Wire Markers, Nylon Cloth, Indoor/Outdoor Vinyl, and Polyester labels. This wide selection makes the BMP21-PLUS great for things like wire & cable, data center equipment, bins, safety equipment, 5S, and more. To order your Brady BMP21-PLUS Portable Label Printer, please visit QSource.com (where you’ll also find BMP21-PLUS accessories and materials). For questions, or additional info, contact us via phone (800-966-6020) or email.